I'm back with another Father's Day card! Back on Tuesday I posted this grungy Father's Day card. Now I'm onto a more simple, clean lined one. 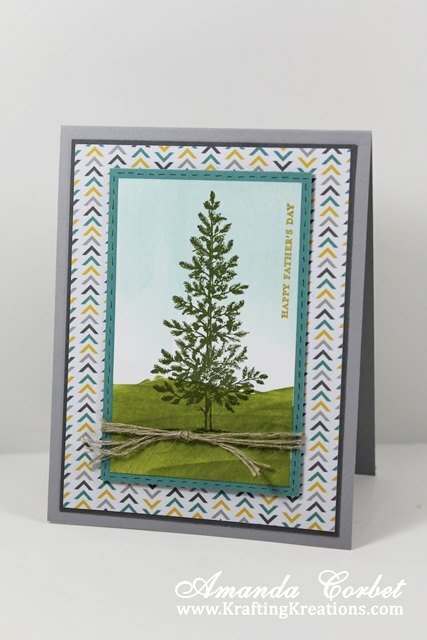 It's been a while since I've used Lovely as a Tree so I decided to pull it out for my second Father's Day card. Basic Gray card stock 3-7/8" x 5-1/8"
Moonlight DSP 3-3/4" x 5"
Lost Lagoon card stock 2-3/4" x 4-1/4"
Whisper White card stock 2-1/2" x 4"
I folded the Smoky Slate card stock on the score line as usual. Then I glued the DSP onto the Basic Gray card stock with some glue stick. Then glued that layer onto the card front with more glue stick. Simple right? Now for the fun part. Take your Soft Sky ink pad and use it directly on the Whisper White card stock and swipe it down from the top towards the center with a light touch. The new foam ink pads really grip the card stock so you don't want to press down very hard at all. Now take your Old Olive ink pad and swipe across the bottom to create some grassy hills. 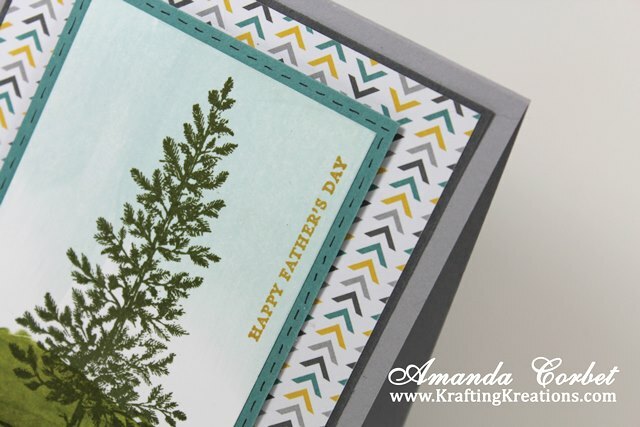 Stamp the pine tree from Lovely as a Tree onto the card stock in Mossy Meadow ink. Then stamp the greeting from Teeny Tiny Wishes in the upper right hand corner in Hello Honey ink. I glued the lovely stamped panel onto the Lost Lagoon card stock with some glue stick then wrapped some Linen Thread around the panel and tied it into a knot. As an afterthought I grabbed my 0.005 doodling pen (I think it's a Prismacolor) and added black faux stitching around the Lost Lagoon panel. 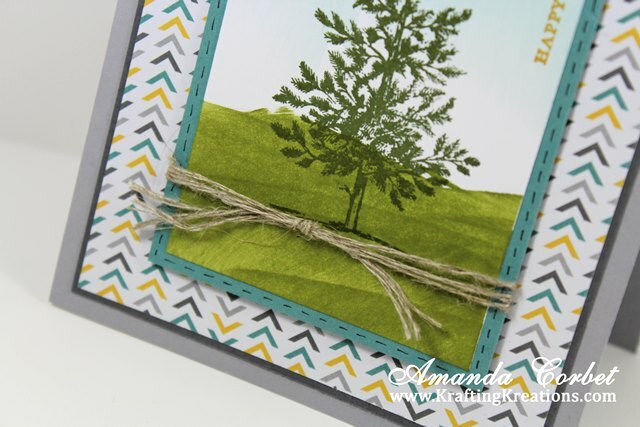 Then I just stuck this lovely layer onto the card front with a few Stampin' Dimensionals. I really love the look of the little scene against the ultra modern pattern. Now for a super simple gift. This is kind of a gag gift and it's safe to post since I know my dad doesn't read here. Dad is always saying he will do something when he gets around to it. So to be funny I made him a round to it. 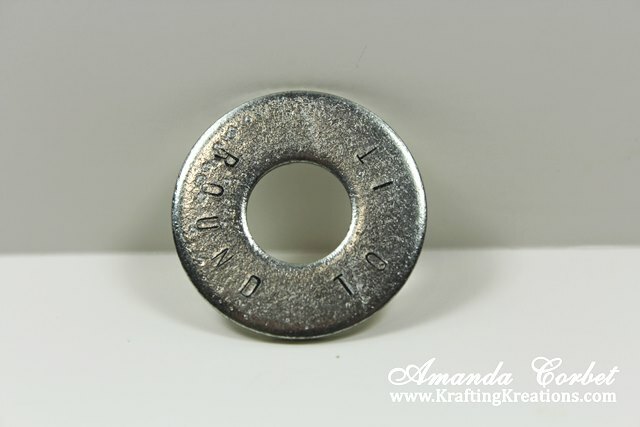 It's just a washer from the hardware store stamped with some metal letter punches. If you're new to using a metal letter punch like I am, don't be afraid to really whack it hard with the hammer. I had to get pretty rough with it to get a good impression on each of the letters. After I had all my letters stamped I took some Black Tuxedo DecoArt Multisurface Satin paint just on my finger and rubbed it into the stamped letters. Then I just let it sit for the time it took for me to grab a paper towel and wipe the paint of my finger and wiped the washer down with a mostly dry paper towel to remove the excess paint. The paint will stay in the grooves of the letters making them easier to see. After letting the paint dry for about 10 minutes I just quickly sprayed it with a layer of a clear sealer. Super simple.